11 games in, is she a bust? Or is she still not 100%? Or would she be better on a different team? I think she's a rookie point guard coming into a system unlike anything she's ever played in before. 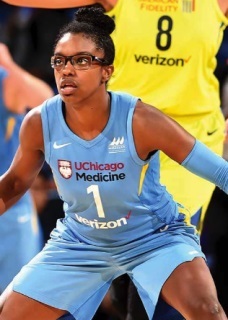 Most point guards need at least 3 seasons to acclimate to the WNBA. Seattle's first round pick in 18 for Plum. I know it is a big risk for Seattle Plum is struggling ATM but Plum being mentored by Bird would be the perfect situation for her, eventually becoming the future PG of the Storm. If she isn't a bust and her shot starts falling Plum is a great compliment to the young core of Loyd and Stewart. Seattle is one of the more popular teams in the league and Plum could even increase their box office. 2018 is deep but Seattle is probably going to be in the top 5 this year so the pick is 8-12 there will be some good player still available even if the likes of Collier and Stevens don't declare but if Seattle thinks Plum is still far from her potential than maybe they roll the dice. They've been looking for the heir apparent to Bird for a while and until she got to SA Plum was looking like the player they have been waiting for. And if worst came to worst and the move blew up in the Storms face they still have a great duo and a good team that could attract free agents for their Championship push that is probably coming in the next few seasons. One wasted draft pick won't derail them too much. It might be dangerous for SA to move on so quickly form a #1 pick that might even be hurt, (the last thing SA would need is to have Plum coming to SA in 2019 with Loyd and Stewart and be killing it as a integral part of one of the top teams in the league) but a second first round pick even in the late half of a deep draft to pair ideally with their #1 pick could be a good move (Imagine they have #1 and #8 and add say Wilson and Nurse or Wilson and Billings, or Wilson and Nared, or Wilson and Russell, or Wilson and L. Brown or Vivians. Wouldn't that be a more well balance team that what they have now?) If not they need to figure out some way to make the Jefferson, Plum and McBride combo work which probably still entails trading someone down the road. I will trade you a cup of water for ten gold coins. But Lysh is super important to their team IMO. She's a great defender that can create her shot in the post and will always hustle. She does the dirty work for their team. I think that she's the type of player Seattle will need for a deep playoff run and if they want to win a championship. She should have gone to a college where she would have learned how to actually play the PG position and how to defend, i.e.,Saniya Chong. Plum is definitely not WNBA ready but she may become so, i.e., Becky Hammon. Although, VJ is starting Plum to give her the best experience she can give her, there's no way she's anywhere near Jefferson - but she's getting the opportunity to learn and grow. My hat's off to VJ and Moriah for working together in trying to get Plum ready. Lmao I mean, you're not wrong. But considering all that she does for the team, she's a keeper. A swiss army knife and their best defender. I'd honestly be more willing to get rid of Lang than Lysh. Her skill set is more replaceable. I'm always amazed at how quick some fans are to declare someone "a bust." She's played all of 11 WNBA games. Do we need to list lots of examples of players that took time to develop? Could Kelsey Plum prove to be a bust? Of course. But I find the posing of this question so soon--whether for Plum or any other player--to be useless. A combo of Wilson and Billings would be pretty nice, or draft the top SF Deshields wit the #1 pick and Billings. Billings is 6'4 super athletic like Gabby Williams. Vandersloot is listed at 5'8 and so is Plum. But on a picture of them standing next to each other you can clearly see that Plum is taller..
How does that picture tell you that? Vandersloot is slouching to the side while Plum is standing straight up. I am always dubious of this kind of height investigation, but if anything that picture shows that Vandersloot is taller. You guys still haven't learned how to post a picture? Plum has bigger feet and thicker limbs. If Plum works as hard as Sloot or Diggins did after their disappointing rookie seasons, she should be alright. She seems resilient and a hard worker. Seattle should work out a deal for her before Bird retires. Bird would be a good mentor for Plum. Peterson is not the future. Seattle does need to start thinking about who'll replace Bird in the next few years. Why not make a move to bring in Plum? Unless the Storm want to transition Loyd into a PG?